TRU-URJ is currently accepting submissions for the 2016 Issue. Please refer to Submission Guidelines for more information on submitting your paper. Students’ Preferences. 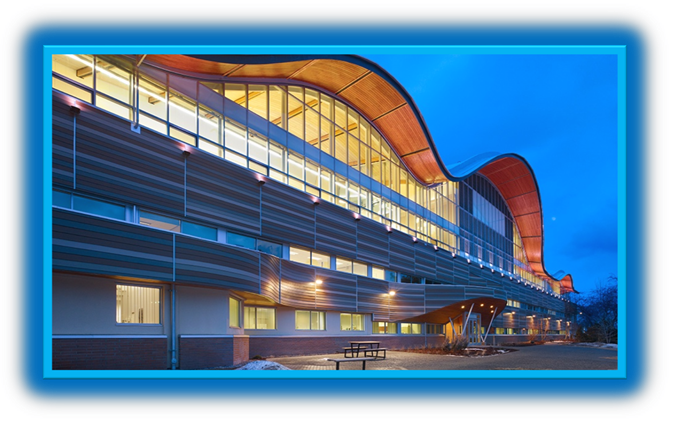 By: Meena Balachandran; Supervisor: Dr. Jim Hu, Department of English as a Second Language, Faculty of Education and Social Work, TRU. Higher Education Premiums in Canada. By: Tatiana Pelaez Jimenez, and Sean Duffee; Supervisor: Dr. Ehsan Latif, Department of Economics, School of Business and Economics, TRU. For More information please contact: Dr. Mohammad Mahbobi. at mmahbobi@tru.ca or 250-377-6145. The TRU Undergraduate Research Journal, TRU-URJ, launched during the Undergraduate Research & Innovation Conference held March 27-28. Submissions are now being accepted for the first edition. Undergraduate students can now share their outstanding research in a meaningful and productive way. 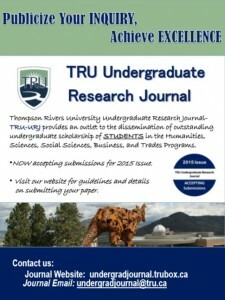 The new TRU Undergraduate Research Journal (TRU-URJ) is an academic for-student and by-student journal, developed with the philosophy that students should not only have a chance to disseminate their research in a journal, they should also get firsthand experience organizing such a publication. Dr. Mahbobi has been working with selected TRU students on the development of TRU-URJ, which launched during the Undergraduate Research and Innovation Conference Mar. 27-28. The journal is now accepting submissions for the inaugural 2015 issue. Alongside Dr. Mahbobi, psychology major Esther Briner and history major Justin Greer will work to ensure that the selected papers meet the standards of the journal. Faculty members will be enlisted to review and provide input, and the students will then prepare the papers for publication. For this year, Briner and Greer have been actively involved in establishing and maintaining the website, and creating guidelines for the papers. “Next year, we will recruit a new group of junior and senior students in order to engage more volunteers from across the disciplines,” Dr. Mahbobi said, calling on students to volunteer for open positions in the student governance body of the journal for fall 2015. Briner has already learned so much from the process of launching the call for submissions and setting up the website, and is looking forward to participating as a member of the governance body for the first issue. While TRU-URJ will first publish electronically via a website developed in cooperation with the Centre for Student Engagement and Learning Innovation’s Brian Lamb and Alan Levine, once established, Dr. Mahbobi expects there will be a print version of the journal made available.